Among the generation philosophers hailing from South India, R. Balasubramanian is a leading figure who has inspired generations of students by his brilliant teaching and writings. He is well acquainted with both the Indian and the Western traditions of philosophy. 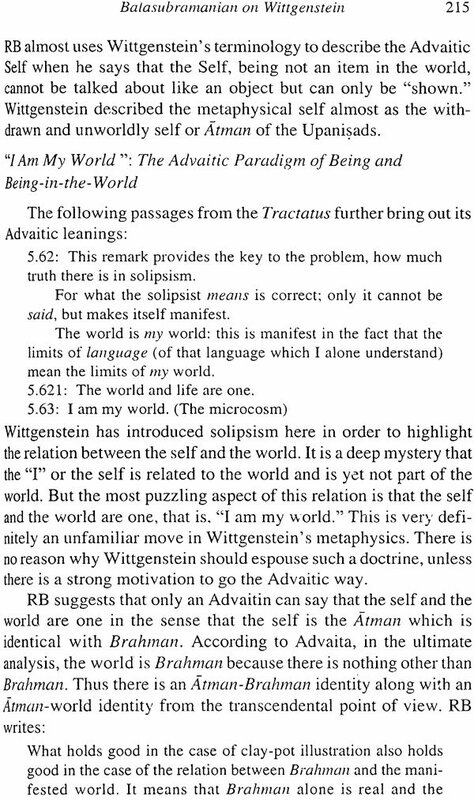 Besides working very extensively in Advaita Vedanta, he has also contributed significantly to comparative philosophy involving Phenomenology, Existentialism and the philosophy of Wittgenstein. He has been a life-long enquirer and expounder of Advaita and therefore this volume brought out in his honour fittingly contains a good number of essays that extend the range and the level of enquiries in that field-a kind of activity in which he himself has been engaged in his own way throughout his career as a teacher and even after retirement. Besides his views on Advaita, his approaches to Existentialism and Analytic Philosophy also receive close attention in some of the essays. There are also a few attempts to give a bird's-eye view of his extensive work. In brief, this volume is an attempt at showing the vibrancy and vitality of the great philosophical tradition-the darsana parampara- to which we all belong. Srinivasa Rao retired as Professor and Head of the Department of Philosophy from Bangalore University and earlier to it, worked at Mysore University. He is a well known scholar in Advaita and Analytic Philosophy. Besides a few papers, his important publications include Advaita: A Critical Investigation (1985) and Perceptual Error: The Indian Theories (University Press of Hawaii, Honolulu, 1998). Godabarisha Mishra is Professor, Department of Philosophy, University of Madras. He worked as an Editor at Kuppuswami Sastri Research Institute, Chennai from 1985 to 1988. His specialization is Advaita Vedanta and he has published twenty research articles besides a few books also, including Anubhutiprakasa of Vidyaranya. 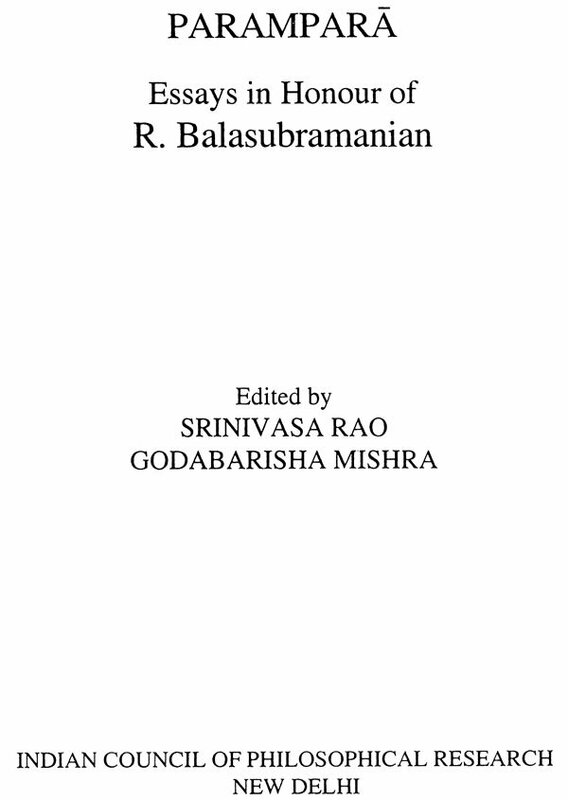 The Indian Council of Philosophical Research, New Delhi, agreed to a suggestion from Professor S. Gopalan of Madurai University and arranged a National Seminar on the "Thoughts and Works of Professor R. Balasubramanian" in New Delhi in 2001, of which Professor V. C. Thomas and Dr. K. Srinivas of Pondicherry University were the Directors. Due to financial constraints, this Seminar had to remain national and all its participants only from within India, though Professor Balasubramanian happens to be an Advaita scholar of international fame. While the Seminar was surely a serious and loving tribute from Indian scholars to Professor Balasubramanian, we still thought that it would be more appropriate to honour him with a volume of essays contributed by select scholars from all over the world rather than from just within India. When we proposed this to the Indian Council of Philosophical Research, it was most readily accepted and we are hence very grateful to Dr. Kireet Joshi, Chairman of the Council and Dr. R.C. Pradhan, the-then Member Secretary, for the acceptance. Since Professor Balasubramanian has written on a wide variety of subjects in his career spanning half a century, it was by no means easy to arrive at an appropriate focus for our volume, a focus that would be fairly representative of all major aspects of his work. 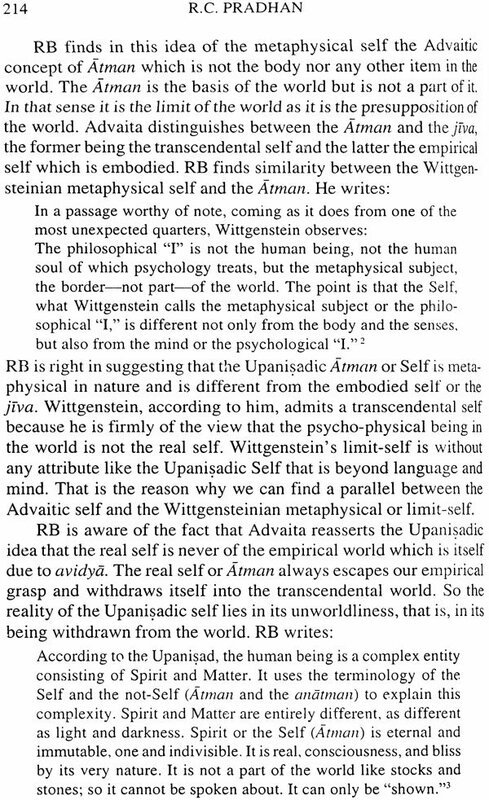 We finally decided that our focus should be on Advaita Vedanta-an area to which Professor Balasubramanian has contributed most-and some aspects of Phenomenology, Existentialism and the philosophy of Wittgenstein which he has interpreted in his own way. Accordingly, we went about making a selection of essays presented at the National Seminar and also writing to several scholars in India and other countries requesting them for essays to be written (or revised, if they had been presented at the Seminar) with the above type of focus in mind. While many of them agreed to our request, some expressed their inability. There were requests from some for extension of the deadline to submit essays and we did extend the deadline though we had problems doing it, but we sincerely regret that we could not accommodate every such request. We had a contribution that was immediately sent upon hearing from us, was also of outstanding quality, but fell completely outside the focus we had specified. We had to drop it regretfully. While we could ask some of the contributors for slight changes which they readily made, we could not do this in the case of Professor Debabrata Sinha who passed away just when he had barely finished writing his essay, which his wife kindly sent to us. For reasons of various kinds such as the above, some readers may find no contributions at all in this volume from some of the closest academic associates of Professor Balasubramanian. This is a matter about which we cannot do anything except expressing our very deep and sincere regrets. In the contributions that came from different parts of the world, there was no uniformity in the use of diacritical marks for spelling Sanskrit words including proper names. This is because there is still no universally adopted convention, and hence we decided to stick to the convention used by Professor Balasubramanian himself in his own writings, at least with regard to the majority of names and words. While this would surely make the volume pleasant reading for the honoree, we hope that it would not be altogether unpleasant to our esteemed contributors and readers. We believe that parampara in India is really a line of thinking that basically preserves and promotes the spirit of free enquiry while also encouraging a personal quest for truth, and that Professor Balasubramanian is an enquirer par excellence in our midst who upholds this tradition. The present collection of essays also very much embodies this spirit of free enquiry--discussing and raising many vital issues that have been dear to Professor Balasubramanian and about which he has written with great zeal and conviction. We are very happy that Professor Balasubramanian's thoughts and style of philosophising have been taken seriously by our contributors and we are therefore led to think that this is their way of paying tribute to him and his life's work. In offering this festschrift, we are honouring a rare philosopher-scholar from South India who has dedicated his life to exploring and re-presenting ancient Indian wisdom. In the preparation of this volume we were assisted in many ways by Mr. R. Mukundan. We particularly appreciate his patience in complying with our constantly changing demands and requests. We consider ourselves fortunate in being the beneficiaries of his loving service and we express our heartfelt thanks to him. We were very pleasantly surprised by the high level of interest shown-and cooperation extended-throughout our engagement in this project by Dr. Mercy Helen and Mr. Sreekumaran of the ICPR office. We are deeply touched by their sincere efforts in ensuring international quality in the production of this volume. While recording our great pleasure and appreciation regarding their efforts, we express our grateful thanks to them. Last but not least, we once again very heartily thank Dr. Kireet Joshi, Chairman of ICPR, for encouraging us in our project and readily helping us in bringing out this volume in record time.